I have an intense love for this particular dessert and it's pretty silly how mushy I get when I bake up a batch of them. Seriously, I start using all kinds of sappy, romantic-sounding words and phrases that weird my family out. 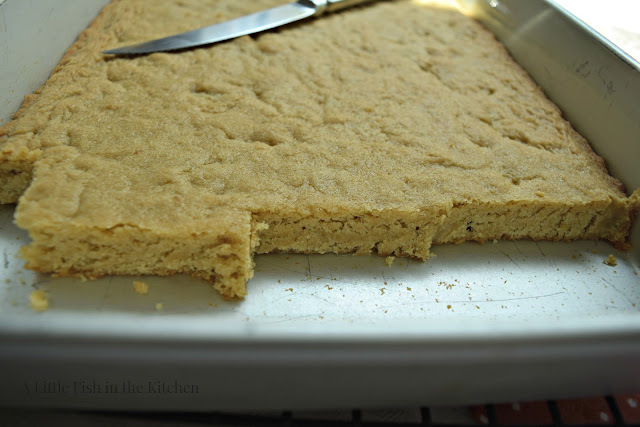 But, (just humor me here for a second) in this recipe it is kinda like butter and brown sugar get married and have the perfect cookie bar baby... right?! Well, anyhoo...I really do see this recipe as a complete and perfect union of two old, dear ...delicious friends. I mean, just look at that pan of golden goodness..(!!) it's just a ridiculously beautiful thing to me. 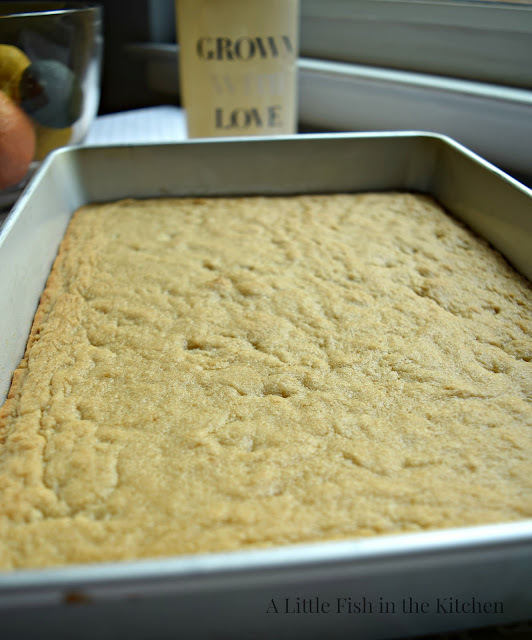 Aside from how scrumptious these blondie bars are, another thing I love about them is how truly simple they are to make! It's a no-fuss recipe that requires just a handful of everyday ingredients to bake a big batch. 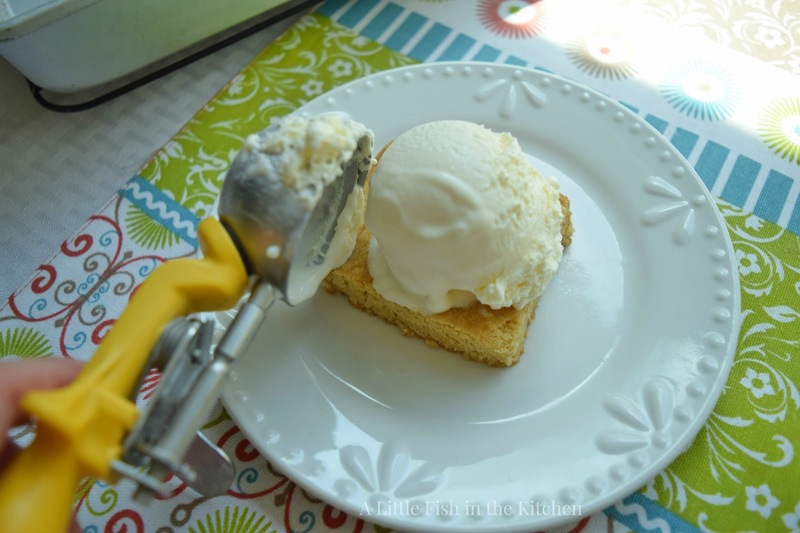 I use this Vollrath ice cream scooper to make even cupcakes too! I love it. I've seen lots of adaptations to the basic blondie recipe over the years, both in print and online. Various versions of these cookie bars call for nuts, chocolate chunks, white chocolate chips, or even shredded coconut being to be added in to the batter, and I'm sure all of those flavor combinations are delicious. Nevertheless, I'll always stick with my gorgeous, butterscotch-y, classic blondies. Every once in while, I'm actually told that my favorite, modest blondies are little boring or there's speculation that the recipe might be a bit better with a little something else added in for texture, etc. Well, you can bet your buttons that I will always and forever disagree completely with those kinds of complaints when it comes to this dessert. But, I will just keep my objections to myself because I truly believe everyone's entitled to their own opinion, after all. However, when it's all said and done, I can usually fix anyone's opinionated, broken wagon with a warm blondie on a plate and one cute, little, foodie term: a la mode! 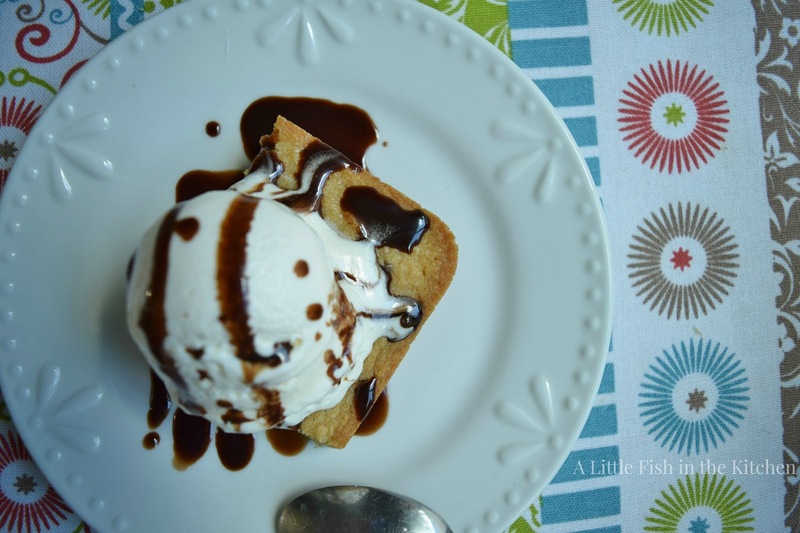 These rich, buttery blondies are wonderful dessert treat with a cup of coffee or you can add a scoop of vanilla ice cream and a drizzle of chocolate syrup to create an perfect, blondie sundae! Preheat oven to 350°. Combine flour, salt and baking powder in a medium bowl and set it aside. In a large bowl or bowl of a stand mixer, cream butter and brown sugar together until light and fluffy. Add in the eggs, one at a time and combine. Gradually add the flour mixture to the butter mixture. Mix until just combined, careful not to over mix the batter. Batter will be a thick, spreadable consistency. Grease a 9x13 baking pan with non-stick cooking spray. Pour batter into pan and spread it out evenly. Bake for 20-25 minutes or until a toothpick inserted in the middle comes out clean. Cool on a wire rack for at least 20 minutes and serve warm with scoops of vanilla ice cream, if desired. That looks sinfully decadent and divine! Hi Marcelle, oh I love these too, they are perfection. I will have to cut the recipe in half because I know myself, I wont' be able to stop eating them until they are all gone. Hi Cheri, I was glad when the rest of the family finished them off because I have the same issue :) Thank you! Buttery blondies? I'm in! These look terrific -- loaded with flavor. Thanks! They are super versatile, Grace! Thank you!! I think it might have just autocorrected your name to Marcella - if it did, it was my laptop, not me! 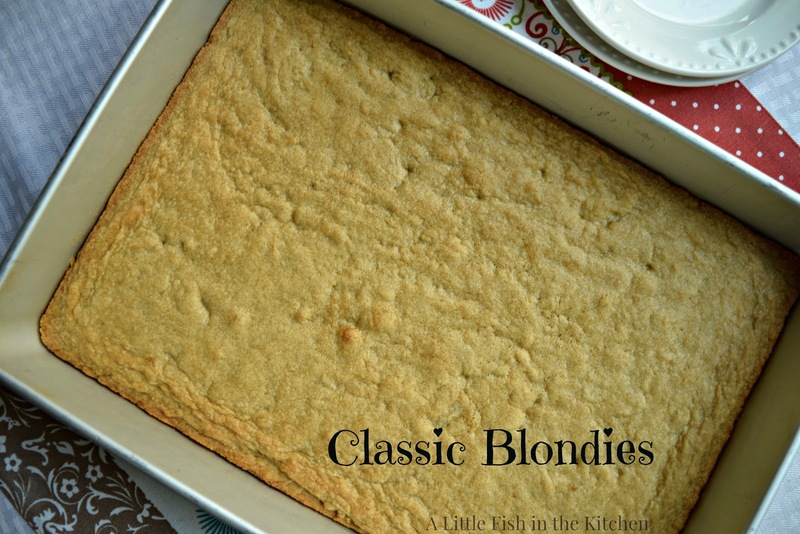 I absolutely love blondies but have never made a batch this simple and classic. I bet it allows the flavors and texture of the blondie to really shine through. My cooking blog is in spanish with google translator in many Languages so I hope you liked. Hi Olga, I will go visit your page! Thank you for your comment! !